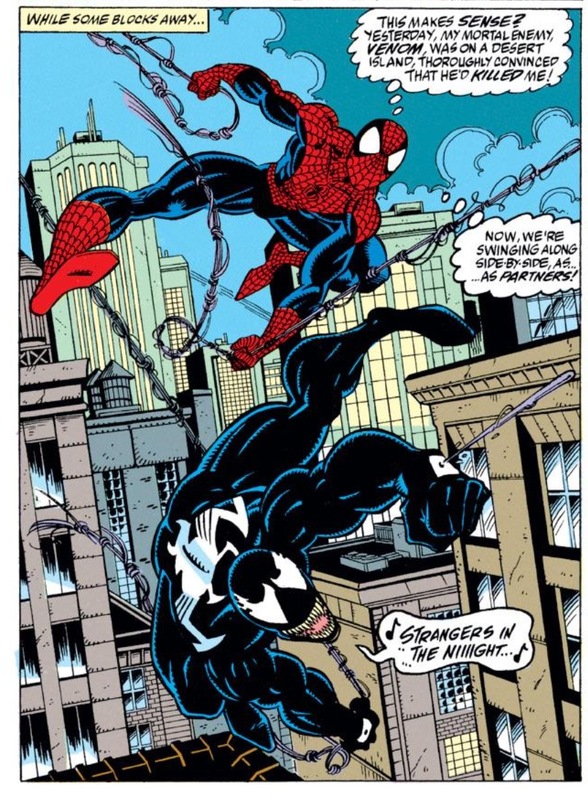 In a continuation from my post about Venom #7 yesterday, I decided to reach ALL the way back in the vault to the distant 1990s to revisit the first-time Spider-Man and the Venom symbiote aligned themselves against a common foe. And while the partnership seemed to work in dispatching an even more demented symbiote in Carnage, the story here (Amazing Spider-Man #363) ends with the Venom (played by Eddie Brock) symbiote being unable to put aside its rage and hatred for Spider-Man, giving readers exhibit A) in the case against the idea that this pesky soul-sucking alien can ever be trusted for the force of good. The current version of Venom, Flash Thompson seems to think he’s one of the good guys, but as former-Venom, now Anti-Venom, Eddie Brock points out in Venom #7, the symbiote is always seemingly in-control. And while the symbiote can sometimes have a warped-sense of justice that inevitably places it on the side of “good,” it’s still way too unstable and inherently reliant on feeding on the dark emotions of others to ever create a truly good-natured Venom. In the case of ASM #363, the final part of a three-issue arc which is notable for the debut of Carnage, Venom/Eddie Brock is willing to temporarily put-aside its sociopathic hatred for Spider-Man because it hates the symbiote that spawned Carnage even more. The way Venom’s logic is explained, the Carnage symbiote, which is attached serial killer Cletus Kassady, kills people indiscriminately and without remorse. The Venom symbiote is only hell-bent on killing Spider-Man/Peter Parker because years earlier, he rejected the alien suit after discovering it was, in fact, alive, and feeding off him. So both symbiotes have murderous impulses, but because Venom is more specific and “logical,” writers have long-played with the notion that perhaps at the core of this creature, it can be reasoned with. And anything that can be reasoned with can perhaps be used for good. The problem with this premise is the source of the symbiote’s rage stems from issues of power and control. In order to survive, the symbiote needs a host to feed off of. The more weak-willed and desperate the host, the more the symbiote is allowed to feed off the individual. 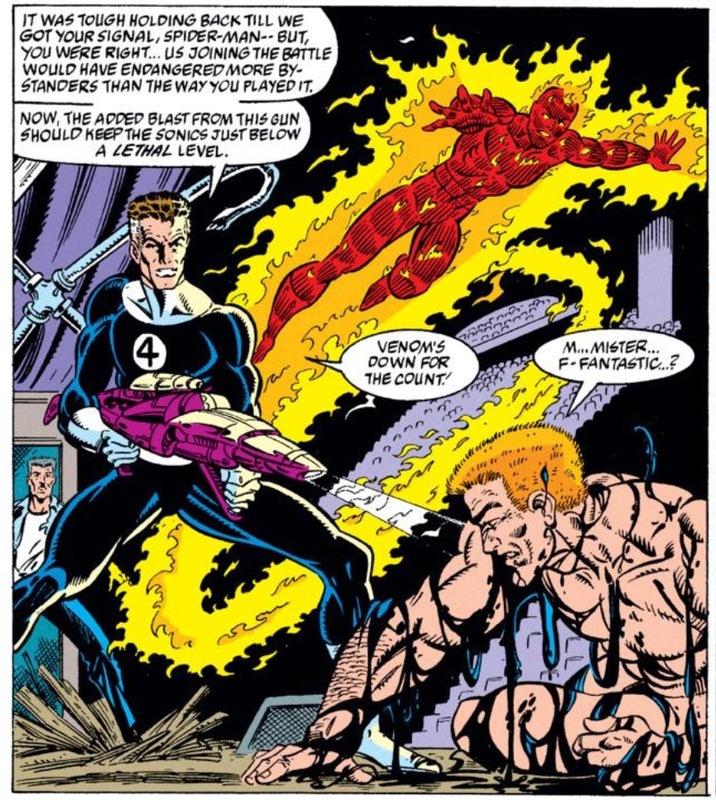 In the case of Venom vs. Carnage, I’ve always got the sense that their feud had as much to do as two competing symbiotes fighting for their spot in the pecking order, as it did with Venom’s warped-code or Eddie Brock and Cletus Kassady’s beef with each other from their time in prison together. I think that because the second Carnage is seemingly apprehended, Venom goes off the deep-end, angry that Spider-Man and his allies don’t have the stones to kill off these competing symbiote. These emotions are then funneled into the symbiote’s overall rage for Spidey, predating the Carnage arc, and naturally Venom’s dark and sinister side take over and he needs to be apprehended. 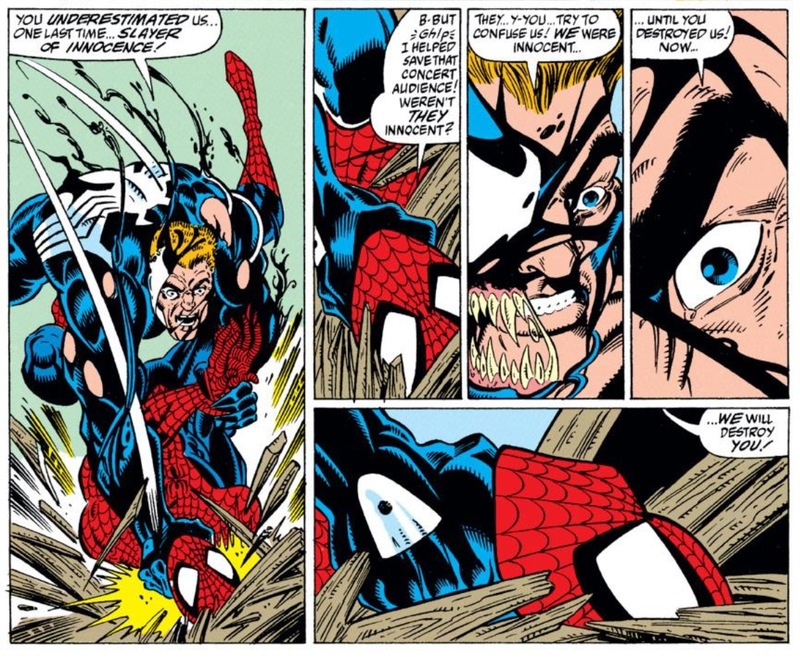 In the Flash Thompson Venom series, we already witnessed what happened when the symbiote comes into contact with Spider-Man. Despite Flash’s admiration for Spidey, the symbiote’s natural inclination is still to kill the web-slinger. In Spider Island, the symbiote gets nose-to-nose with another person who rejected it with Brock. Again, this all ties-in to the issue of control. Above everything else, the symbiote is a preservationist, willing to do whatever it can to survive. And since its rejection by Spider-Man and Brock put its survival in jeopardy, the symbiote ultimately remains unreasonable. I thought back to this scene in ASM #363 because I believe unfortunately it foreshadow the dark and ominous cloud that has been following Remender’s Venom series since it was launched earlier this year. Flash Thompson, despite being introduced in the 1960s a jerky-foil to Peter Parker in the early days of ASM, is a decent human being at the core. But the same could be said for Brock, who despite some of his instability, is emerging as a reliable ally for the “good guys” in the Marvel universe. The problem is, as long as the Venom symbiote exists, whoever it controls will never be able to put their good intentions over the preservationist needs of the alien suit. Which means things are not going to end well for Flash.